Pharmacology is the branch of medicine and biology concerned with the study of drug action. Well-equipped labs help train the students in practical study of anatomy, physiology and health education, pharmacology, chemotherapy and bioassay of various drugs. The advanced pharmacology lab is also designed to carry out animal model experiment for analgesics, antihistaminic, anti-pyretic, anti-hepato toxic, anti-ulcer, anti-inflammatory activity testing of known and new drugs of synthetic and natural origin. Pharmacognosy is the study of medicinal drugs derived from plants or other natural sources. Studies on drugs produced with herbal sources are on the rise. The department enables the students to acquire the skills of identification, morphological and microscopical studies, isolation, estimation, pharmacological uses and formulation aspects of various medicinal and aromatic plants of traditional value. Special facilities have been created to impart training in tissue culture techniques. Laboratories are also equipped with facilities such as extraction assembly, column chromatography, colorimeter and photo microscopy. Pharmaceutical chemistry is focussed on quality aspects of medicines including the new drug development. Three well-furnished sophisticated laboratories provide the facilities for practical training in pharmaceutical medicinal chemistry including synthesis and structural elucidation of medicinally important compounds, analytical chemistry, organic chemistry and biochemistry with well-designed experiments. Instrument room is equipped with the latest analytical instruments, which enables the students to acquire hands-on training on the instruments. It facilitates imparting the practical training to the students in pharmaceutical and analytical chemistry and assists in research work. The laboratory includes sophisticated instruments like HPLC, digital flame photometer, UV visible spectrophotometer, elisa plate reader, rotary vacuum evaporator, Karl-Fischer titrator and photofluorimeter. Pharmaceutics is a truly multidisciplinary specialisation focused on the science of drug delivery. The department is furnished with state-of-the-art equipment and machineries, required for imparting knowledge of various processes used in manufacturing of pharmaceutical dosage forms like tablets, capsules, ointments, liquid orals, parenteral, novel drug delivery systems and packaging science, etc. 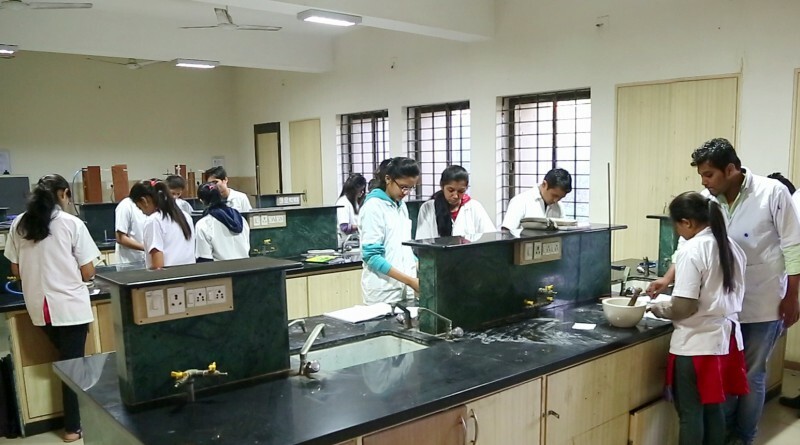 There are three well-appointed laboratories which cater to the practical requirements of the subjects of drug and cosmetics technology, biopharmaceutics dosage form design, biological pharmaceuticals, physical pharmaceutics, dispensing pharmacy, pharmaceutical engineering and unit operations, as per the norms of AICTE and PCI. A top of the line microbiology laboratory is designed as per FDCA norms for class 10,000 aseptic for parenteral. It will help students familiarise with the Current Good Manufacturing Practices (CGMP), design, development and maintenance of aseptic areas, procedure for sterility testing, experiments in biotechnology, growth cultivation and isolation, identification of microorganisms and microbiological assays etc.